Caring Transitions of North Broward serves Pompano Beach, Coral Springs, Tamarac, Margate and Fort Lauderdale as well as the surrounding areas. By working with Caring Transitions, your process can be as seamless as possible without the stress of doing it on your own or with multiple companies. 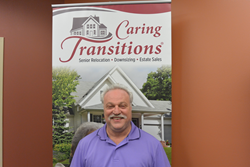 When Larry Cohen discovered Caring Transitions and learned about how the company’s services can positively impact families, he knew he’d found his next business. Now Cohen is excited to announce the launch of that business – Caring Transitions of North Broward. Caring Transitions is America’s largest resource for managing senior relocations as well as downsizing and estate liquidations. In addition to organizing, packing, de-cluttering, moving and resettling, Caring Transitions can handle estate sales, liquidations, and preparing homes for market. Caring Transitions of North Broward serves Pompano Beach, Coral Springs, Tamarac, Margate and Fort Lauderdale as well as the surrounding areas. “We can help anyone with moving or estate liquidation, but our specialty is helping the elderly downsize, declutter, organize and relocate. We are here to hold your hand from the beginning of the process to the very end. Transitions like these can put an emotional and physical strain on families, but it doesn’t have to be that way. By working with Caring Transitions, your process can be as seamless as possible without the stress of doing it on your own or with multiple companies,” Cohen said. Cohen is no stranger to business – he owned a home improvement company for the last 18 years and worked for the Miami Herald before that. He enjoyed the home improvement business, but changes in the industry made doing business difficult, so he was looking for a change. His research into the home health industry led him to Caring Transitions. Cohen is a Certified Relocation and Transition Specialist, a designation bestowed by an independent organization that evaluates providers of senior relocation services. Caring Transitions of North Broward is bonded and insured and all employees are background-checked. For additional information about Caring Transitions and to learn how the company can help you and your family, call (954)551-0205, email LCohen(at)CaringTransitions(dot)com and visit http://www.CaringTransitionsofNorthBroward.com.